To some, this is kind of like asking what love is, what memory is made of, where the end of the universe might be… But wait. We know that it's a type of writing. What kind of writing gets this label? Does it have to rhyme? Or should it avoid rhyme, to be modern? Does it require complicated forms and counting syllables? Do you have to feel more deeply than other writers, or know all about Greek and Roman mythology? Should it be harder to understand than a story? These are the common questions that many people have when approaching poetry, because they're worried about not knowing enough. In fact, some people can even feel embarrassed when faced with a poem, because they don't "get it." Even though much of the poetry being written and published today goes against these ideas, there is still a sense in the world that it's got to be filled with words that you need to look up, concepts that make you go huh?, and lofty ideas about Love and Death and Politics. This is not the case. Sure, there are many poems like that, and in the history of poems, there have been periods when poets have written in very formalized, structured ways. But if we think of how poetry got its beginning — a means of capturing knowledge and spreading it orally before printing was invented, — then we might imagine that the way in which it was told would need to appeal to its audiences. This was done via verse and song by the troubadours, roaming and spreading news of the land when this was all they had. Does rhyme rise solely from this tradition? Perhaps. Or maybe it's just that we like the way words sound when put them together, when the mouth is made to repeat a movement. It's also one of the best devices for helping us to remember. Our brains like shortcuts. If you say that last line again, and out loud, you'll see that your mouth was forming similar shapes: the "m" was repeated. This is alliteration, and it's just one tool in poetry to give your words more power. To the right is a poem, Ars Poetica, which was believed to first be used by Horace, a Roman poet, as a title for a poem. Here is a modern versions. It translates as "the art of poetry," and is now sometimes meant to signify a meta-art form, i.e., a song about a song, a poem about a poem. "Ars Poetica" from Collected Poems 1917-1982 by Archibald MacLeish. Copyright © 1985 by the Estate of Archibald MacLeish. So, can we settle upon a definition of what poetry might be? Aside from MacLeish's ideas, which are a tall order when trying to figure out what a poem is, it might help to look at a few definitions. 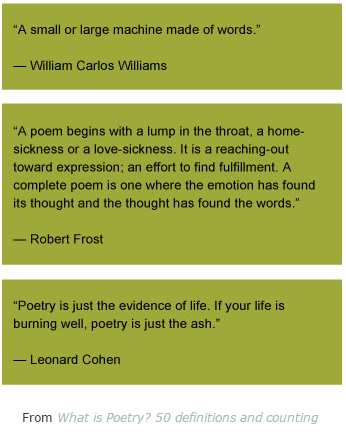 And let's keep in mind that the word poetry comes from the Greek, poeisis, which simply translates as "a making." VIEW VIDEO: Think of "Art" as any sort of creative expression, burning to come through you, and out into the world. While you watch this, notice any memories or emotions that come up for you around the practice of making art. Make sure your sound is turned on. artist when you grow up. In this unit, my hope is you return to that state of joy and excitement, as you begin to write first drafts of poems. However, writing can take us into emotional terrain that isn't easy to explore for most of us; poetry can often take us there with even more intensity. The state of excitement I'm referring to is more about the satisfaction around getting your particular thoughts onto the page, and since every one of us has our own way of experiencing the world, this is something only you can do. In the Padlet below, create your own definition of poetry, or choose from one of the definitions above and discuss what it means to you.